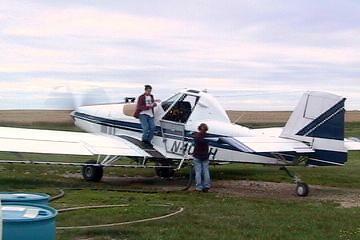 Our company has been providing aerial application of farm chemicals since 1986. Our base of operation is the Staples Municiple Airport. We have satelite airstrips located in Clarissa MN, as well as one near Parkers Prairie Mn. We use the latest technologies on our aircraft to ensure accurate and efficient application including Global Positioning System (GPS)equipment. We currently operate an Ayres Turbo Thrush airplane and a Weatherly airplane for application needs. Whether you have pre-emerge or post-emergence herbicide needs, insect infestations in your crops, or fungicides to apply, we have the equipment and knowledge to get the job done. Call Ken today to learn more.